Alaska Native peoples bring talent, spirit, beauty and a great sense of comradery to signature events year-round. Modern Athabascan Indians from the Interior and Inupiat Eskimos of the Western Arctic Coast thrived without western amenities for hundreds of years. Cultural activities and art of all kinds are part of Alaska Native people’s daily lives. 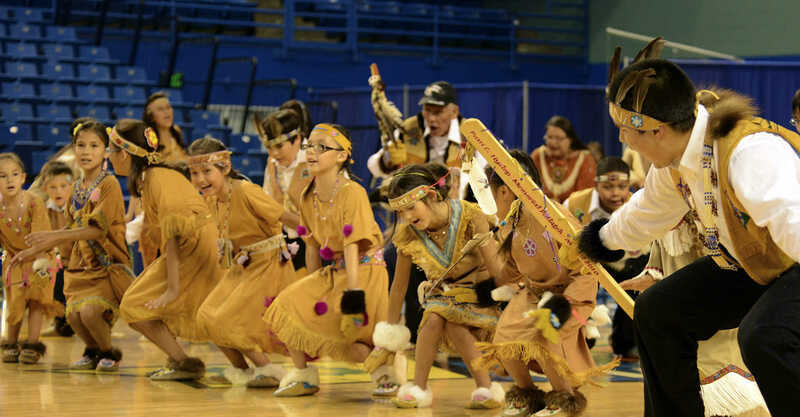 These endeavors, whether they are dancing, drumming, sporting activities or the creation of arts and crafts are all on display in authentic Alaska Native events that take place throughout the year. Fairbanks’ heart beats a little faster when the World Eskimo-Indian Olympics come to town. The energy-filled games of the far north are simply amazing. Endurance, agility and a bit of magic are all in the mix when viewing the sporting events and the athletes going for the gold. The Alaskan high kick, knuckle hop and the four-man carry are just three of the many athletic events that boggle the mind. Imagine hopping on bare knuckles across an unforgiving floor…or flying eight feet into the air to kick a sealskin ball! In addition to the extraordinary games are the pageant events where beautiful gifted Native women vie for a crown of walrus ivory and whale baleen. And cute toddlers enter the baby pageant, (perhaps it’s the parents that do) and wander doe-eyed across the stage in fantastic hand-stitched garments made of moose and seal hide, embellished with beads and quills and exotic furs like wolverine and lynx. And if music and dancing are what you’re after, you won’t be disappointed by the inspiring Native song and dance woven throughout the program. All of this and more can be found at the Carlson Center in Fairbanks, Alaska in the latter half of July. Celebrate Alaska Native cultures! The Festival of Native Arts features a variety of outstanding performances by Native peoples from all over the state. Festival attendees can see art demonstrations, cultural films and traditional songs and dances (and occasionally join in too). The festival is also a venue to purchase authentic arts and crafts directly from Alaska Native artisans.